Today I am continuing my hunt for Watch List shares by looking at Best of the Best (BOTB). * Long-time entrepreneurial ownership: The chief exec established the group during 1999, has been in charge ever since and continues to boast a 50% shareholding. * Worthwhile growth history: Online sales quadrupled in value between 2012 and 2017 and currently represent 82% of total revenue. * Conservative funding: The accounts have regularly showcased net cash and special dividends, and may in time enjoy a VAT reclaim windfall. As usual, I am applying a question-and-answer template to help me pinpoint companies that match the criteria set out in How I Invest. I am looking for as many Yes answers as possible. Does the business boast a respectable track record? BOTB was established during 1999 by William Hindmarch and his desire to “give people a great chance to win the car of their dreams for a small amount of money”. 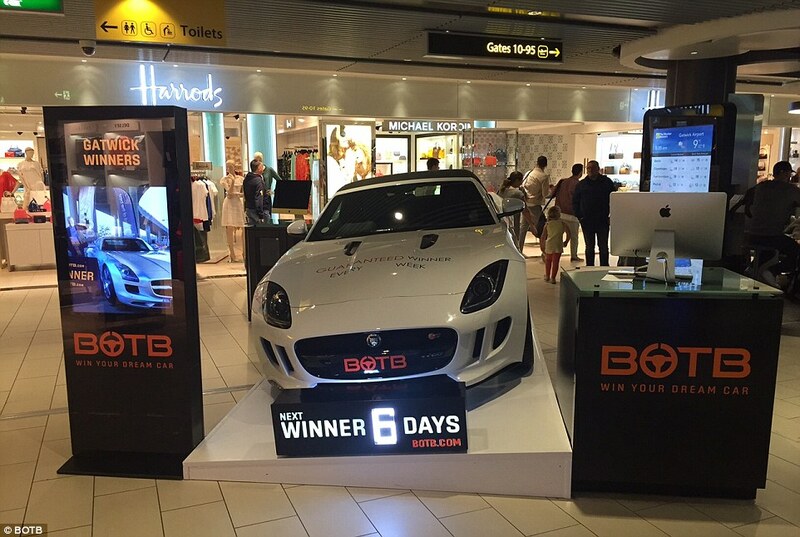 Airport displays are located currently at Gatwick, Birmingham, Manchester, Edinburgh and Dublin, with a further display at a Westfield shopping centre in London. BOTB joined AIM during 2006 and the group’s website contains the Admission document and all of the subsequent annual reports. Furthermore, Companies House supplies the abbreviated accounts from before the flotation. By 2017, revenue had expanded to almost £11m while operating profit had advanced to £1.5m. However, a substantial setback occurred during 2010 when airport owner BAA terminated BOTB’s display arrangement at Heathrow. The decision prompted a 37% sales slump and by 2012, BOTB’s earnings had turned to losses and the dividend had been cut by 33%. The firm’s growth rate during the last decade has been acceptable but not spectacular. I am pleased BOTB’s financial record has been free of exceptional items and other complicated accounting. Meanwhile, a £1.2m tender offer during 2011 that purchased 17% of the group’s shares now looks a very smart move — the offer was priced at 63p. In addition, special dividends totalling 31p per share were declared between 2014 and 2017, with a further 7.5p special payout distributed earlier this year. Has the business grown mostly without acquisition? 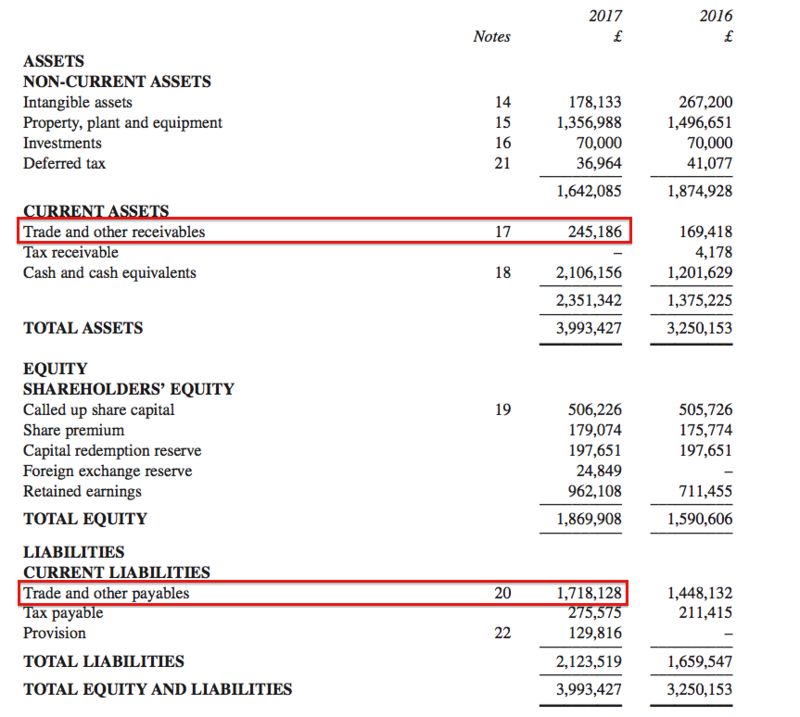 The 2017 balance sheet carries no goodwill, and only minor investments have been made in other companies. Has the business mostly self-funded its growth? The 2017 balance sheet displays share capital of £685k versus earnings retained by the business of £962k. The balance sheet has been free of debt since the flotation, while the proceeds from new shares have totalled only £231k since 2013. Does the business possess an asset-strong balance sheet? BOTB’s 2017 balance sheet carried cash of £2.1m, no debt and no pension obligations. As such, the £2.1m cash position is mostly the result of BOTB owing money to somebody else — or perhaps carrying money that has been paid by customers but has yet to be recognised as revenue. Either way, the full £2.1m cash balance does not appear to be entirely surplus to requirements. BOTB does not clarify what the dominant ‘other creditors’ are. I suspect they represent the sums paid by customers ahead of the relevant competition. From these figures I would say genuine ‘surplus’ cash to be the £2.1m in the bank plus the ‘negative’ working capital position (£245k less £1.7m), or approximately £645k. Does the business convert profit into free cash? Working-capital movements have been consistently favourable, and underline the suggestion that the business collects lots of cash from customers before it has to purchase the dream-car prizes. Meanwhile, the aggregate net cash expenditure on tangible and intangible assets for the last five years has been matched by the total depreciation and amortisation charged to reported earnings. Does the business enjoy a competitive advantage? 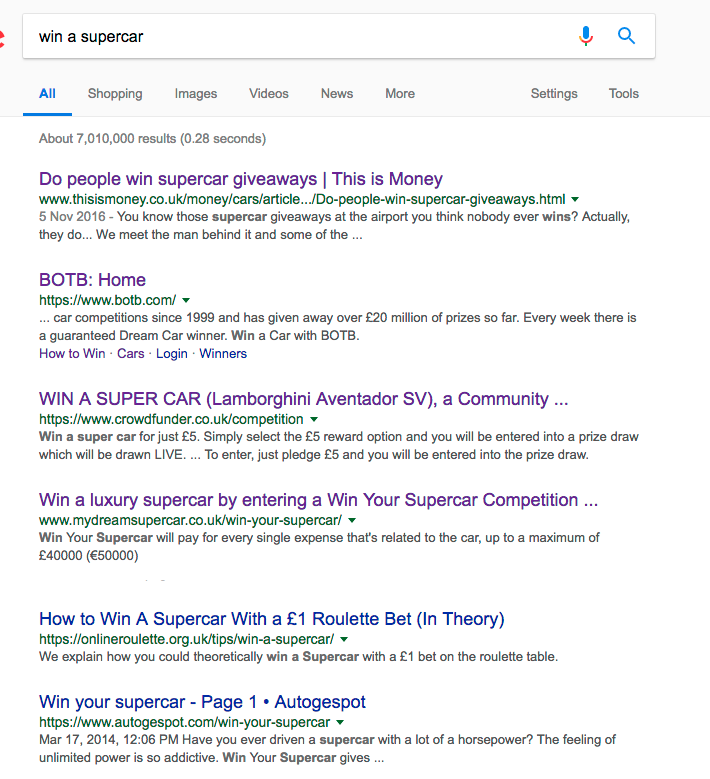 Certainly there are not many other websites offering the chance to win a supercar. …returned failed sites such as this and BOTB affiliate sites such as this. A 14% operating margin was reported for 2017, which does not suggest BOTB can charge what it likes for tickets. Customers will only pay so much for the opportunity to win and the alternative could easily be not to bother. I have to admit, a 14% operating margin for a mostly online business does not seem that remarkable. If the physical sites contributed nothing to profit during 2017, I calculate the online division could have enjoyed a useful 18% margin. Indeed, I would like to think underlying margins could increase from here if ticket sales improve — and a lid is kept on the sums spent on prizes. Does the business produce a respectable return on equity? Return on average equity for 2017 was £1.4m/£1.7m = 81%. A superb result, and no doubt a reflection of the asset-light online operation and the aforementioned ‘negative’ working-capital position. Prior to 2015, BOTB’s return on average equity rarely topped 20% due to (I presume) the greater assets and lower profit associated with the airport sites. Does the business employ capable executives? The aforementioned Mr Hindmarch has run the business from day one and is therefore entirely responsible for the group’s progress to date. Mr Hindmarch turns 44 this weekend, so the risk of retirement appears low for now. Mr Hindmarch is assisted by a commercial director with 12 years of board service. Does the business employ good-value-for-money executives? During 2017, Mr Hindmarch collected a £134k wage, a £70k bonus, benefits worth £7k and a £14k pension contribution. Such payments do not strike me as grandiose for a business producing a £1.5m profit. In addition, the archives show Mr Hindmarch commendably taking a pay cut — his salary dropped from £120k to £108k — when the business reported a loss during 2012. The pay levels are all the more admirable given a Hindmarch family member is the chairman of the remuneration committee. The same committee has limited Mr Hindmarch’s annual salary growth to an average of only 4% during the last five years. Does the business employ owner-orientated executives? Mr Hindmarch appears to be a long-term shareholder. He did not sell any shares at the 2006 flotation and has since reduced his holding only once — by participating in the aforementioned 2011 tender offer. Mr Hindmarch currently enjoys a 50%/£11m stake, while the group’s commercial director boasts a 15%/£3m holding. The declaration of four special dividends during recent years underlines the notion that Mr Hindmarch has a sensible view of handling surplus funds. I also note outstanding share options had topped 1 million just a few years ago but now number just 30,000. Does the business enjoy reasonable growth prospects? “During the period and subsequently we have made significant changes to our pricing model. It has been our ambition, as we move to an almost exclusively online business, to reduce ticket prices and to widen our addressable market. However, today’s statement did not mention anything about 2019. Sadly, BOTB’s registration for the payment of Remote Gaming Duty is set to effect earnings from this year. The registration follows a legal ruling concerning the validity of VAT payments with spot-the-ball competitions. Does the share price stand a good chance of becoming a bargain? The shares do not appear obviously cheap at present. A “forecasted” profit before tax of “not less than £1.2m” would give earnings of almost 10p per share after standard 19% corporation tax. The P/E would therefore exceed 20 with the shares at 220p. Even if the aforementioned £4.5m VAT repayment claim was paid in full — and took the ‘surplus’ cash position to beyond £5m (or 50p per share) — the cash-adjusted P/E would still come to approximately 18. I must admit, that rating does seem optimistic for a business that recently reported flat revenue, and where earnings are predicted to slide 20% during the next year or so. Meanwhile, the 1.4p per share ordinary dividend provides a tiny 0.6% income. Is it worth watching Best of the Best? I have to confess, BOTB does have its drawbacks. Ticket prices have had to be cut and January’s results were not spectacular. Furthermore, the forthcoming payments of Remote Gaming Duty are set to hurt earnings while the market cap — despite falling almost 50% from its all-time high — does not offer a clear-cut bargain. Other downsides include the potential for adverse regulation changes (always a risk with gambling firms) and the illiquid nature of the shares (the value of the free float is only £6m). In particular, the group’s founder remains in charge, he continues to own a sizeable shareholding, he still pays himself a relatively modest wage and he likes to distribute surplus cash via special dividends. In addition, the online division’s expansion record is attractive, as are the firm’s equity returns and cash flow characteristics. Plus, the business appears relatively simple to understand and operate, and should enjoy decent economies of scale if ticket sales can grow faster than the prize fund. I also wonder whether the physical sites could one day be closed to increase the simplicity of the business further. For now at least, I think there is enough here to keep watch. With subdued earnings progress expected during the next year or two, perhaps better buying opportunities may lie ahead. Disclosure: Maynard does not own shares in Best of the Best. This entry was posted in Best of the Best, My Watch List and tagged Best of the Best, BOTB on May 16, 2018 by Maynard Paton. I have followed Paul Scott’s reports on his SCVR’s over the years regarding BOTB. Have never been convinced enough to buy shares in the company though. Can’t help but feel three is great opportunity with this company to move ahead at a much faster rate than hitherto. Current management/owner appears to be very conservative IMO. I have a feeling that a lot more could be extracted out of the company with a little bit more financial ‘engineering’. 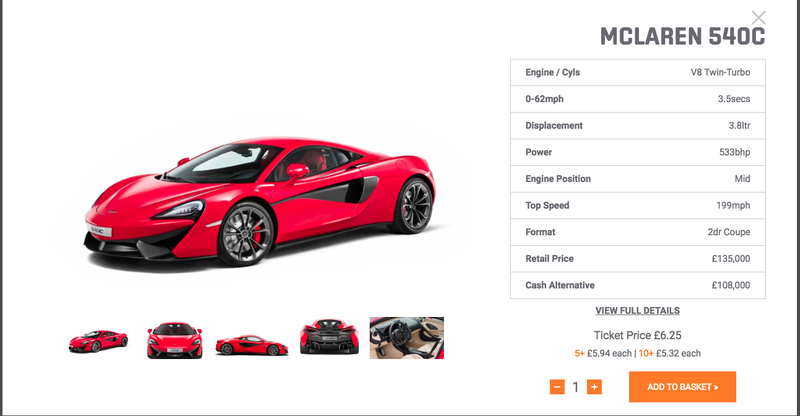 Should this company even be listed on the exchange; seems a more suitable vehicle would be for it to be privately held. Perhaps other questions to ask in reviewing BOTB is how well you believe they do should when there is a downturn in the general economy (could be good for them or bad because of significant increased marketing spend??) and what is anything are they doing to reduce the cost of acquiring these prizes? Thanks for the Comment. Yes, I would agree that, as the business becomes predominantly online, the growth rate ought to be greater. I should have added in the Blog post above that in the latest H1, online sales gained 9%. So the flat overall revenue performance was due to lower sales at the airports. The question of having a listing cropped up at about 18mins. The story is the company needed funds originally for the airport displays and a listing would help counter the “trust issue” of whether anyone actually won. Whether a listing is required now is up for debate. Probably not. But investing in businesses that don’t really need a listing can be quite rewarding. Otherwise you end up with shares that have to raise money and/or like issuing loads of options. The cost of the prize fund has been rising a little of late, as the firm has enhanced the cash-alternative awards. Good write up. It is definitely an interesting small cap to watch. One drawback for me is that the reports are a little light on detail. It would be useful to have more information on the customer make-up, customer acquisition costs etc to get a better feel for the business. Of course they don’t want to reveal trade secrets so this is understandable.